First let me tell you that my grand sort out continues. I am on a mission and already I have got rid of loads of stuff although I am sure Paul and Kieran might disagree. I feel we often try and convince ourselves that we will fit back into that outfit but if we have not worn it for years, we can do without it...It's like a declutter for the mind too! Anyway to the new products. 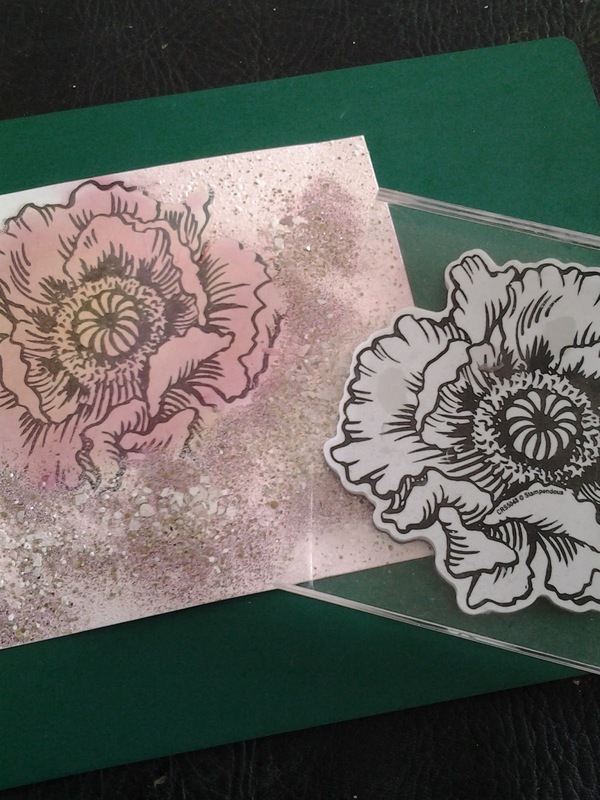 STAMPENDOUS have designed some more of their jumbo stamps - Poppy and Daisy. Included in the pack is a mask which enables you to put the stamp to more uses. 1. Stamp image onto base card using Versafine Onyx Black Ink. Allow to dry. 2. Colour image using your current favourite method. I like the soft effect you get when using chalks and I usually apply with my fingers so you can smudge the colours together. 3. Place the mask over the stamped image and then swipe Versamark ink pad all over the exposed card. Remove mask. 4. 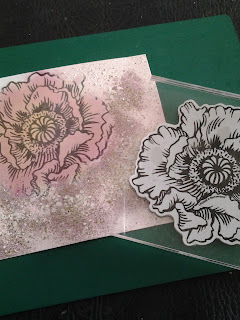 Now add a layer of Shabby Pink Embossing Powder, a sprinkle of Lavendar Chunky Glass Glitter and a few Rose Fragments - all from the "Frantage" range. 5. Next, apply heat directly underneath with your heat gun. This creates a molten affect and the glitter and fragments bond and fuse onto the embossing powder. Don't heat from the top - it will blow everything off. WARNING You are using direct heat so be careful not to burn yourself. 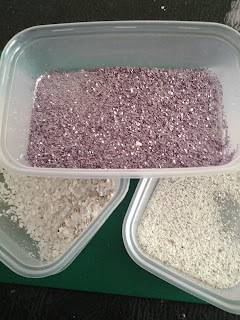 The embossing powder when heated also gets very hot so don't poke fingers into it either!! Thank you Carol... great stamp!